Amanda Price, wife of a Mississippi high school football coach was gunned down Monday night after she found a man lurking in the family house backyard. Amanda Price’s husband, Ron, was also shot as he sprinted outside their New Albany home to help her, but he is expected to recover. New Albany Police Chief David Grisham says the shooting happened just before 10:00 p.m. on Monday. David Grisham said Amanda Price had gone outside to take their dog out and startled someone, who shot her in the chest when she screamed. Hearing the screams and gunshots, Ron Price, who was inside the house, ran out to help when he was shot in the shoulder. Ron Price, who was able to call 911 after he was shot, was treated and released early Tuesday morning from North Mississippi Medical Center in Tupelo. 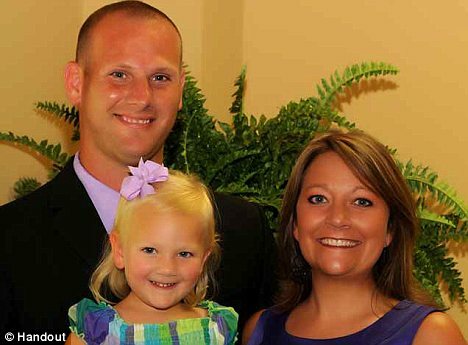 The couple’s three-year-old daughter Molly, who was inside the house at the time of the shooting, was not hurt. New Albany Mayor Tim Kent told WTVA.com that the couple was always willing to help in the community. Police have few clues about the killer, but believe he may be linked to a series of car burglaries in the area at about the same time as the shooting. Ron Price had recently completed his fourth season as head coach for the New Albany Bulldogs. Amanda Price was a speech pathologist in the same school district. A $20,000 reward has been offered for any information leading to the arrest and conviction of the killer.